The fibre optic gyroscope (FOG) provides extremely precise rotational information. Unlike the classic spinning-mass gyro, it has no moving parts and does not rely on inertial resistance to movement. Often due to their intrinsic reliability, FOGs are used for high performance space applications which is why Geovista chose to use this in their downhole logging Gyro. The Gyro has an OD of 34mm so it is designed to run in any environment including inside drill pipe. The tool is run on wireline with real time readout at surface. A magnetometer/inclinometer is also used within the sonde as well as the FOG. Directional data is collected at predetermined points downhole while the tool is stationary. 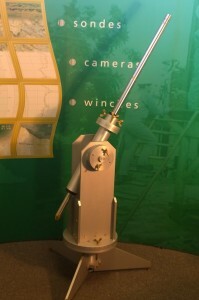 The gyro can be connected to most other Geovista sondes and run in hole (logged separately unlike the verticality tool) and uses the same acquisition system at surface (GV Logger). The tool will output high accuracy azimuth and deviation data in any environment without the need for a calibration at surface. Utility and pipeline crossings management, mining surveys, construction, Multi-well planning, slot-target allocation, prevent wellbore collisions, assures correct directional drilling operations, accurate target of resources, conformation of borehole trajectory, well planning, precise reservoir/resource delineation, accurate correlation with other logging measurements, resurvey existing wells to correct for survey errors, re-map resources, steering, orient downhole assemblies and resources, define orientation of logging tools, axis orientation of geophones and legal requirements. Most importantly, accurate gyro surveys act to save costs from inaccurate and potentially catastrophic collisions, incorrect trajectory, bad well planning and missing reservoir targets.